Perfect for controlling the temps of your kegerator and/or fermentation chamber! Easy-to-read digital front panel for keeping precise control on temperatures! A digital temperature controller from Johnson Controls with a load of features! Johnson Controls has been a major name in temperature control for years, and many homebrewers have used their analog controller with great success for fermentation control. 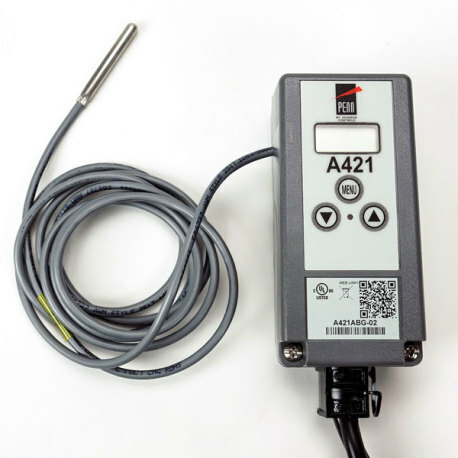 Now, we are proud to bring you the A421, a digital temperature controller with an easy-to-read LCD display. This controller features a thermoplastic enclosure and A99 temperature sensor. It has a wide (1 to 30F or C) differential adjustment range that provides a tight control on your temperatures. It also has a adjustable anti-short cycle display that ensures that the output relay remains off for a time delay set by the user. This helps to avoid hard starts, overload outages and equipment wear. 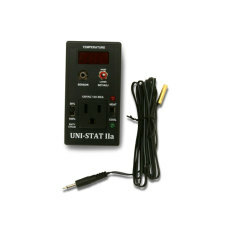 With a lockable front panel touchpad, this is a great digital temperature controller for an affordable price! Easy-to-read front panel back lit display makes programming and keeping an eye on temperatures a snap! Lockable front panel touchpad for tamper-free temperature control! Standard 120v power cord included, pre-wired.